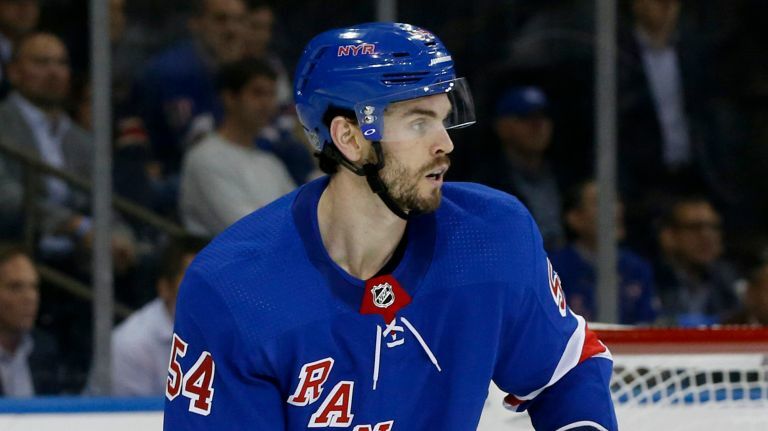 As the Rangers have finished up their third minor trade –turning two AHL veterans and Cody McLeod into three viable assets– last night, Darren Dreger went on TSN and stated that there could be a connection between the Rangers and Toronto on defenseman Adam McQuaid. Color me skeptical on this one, because Kyle Dubas is known for being one of the brighter young minds in the NHL and McQuaid is just flat out not good. He’s a right handed defenseman, and Toronto’s blue line is still a bit of a mess even after the Jake Muzzin acquisition, but this seems like a weird match. There’s an argument that his “veteran presence” can help the young Leafs, especially since Ron Hainsey is the elder statesman there. The Rangers gave up a 4th and a 7th to get him, so getting that or more in return makes it worth while. ← Keeping Kevin Hayes? Contending? Why not? He’s the type of player that could have more value to a team in the playoffs than in the regular season — his speed is an issue but given the right circumstances his intangibles can somewhat outweigh his deficiency. As long as somebody takes McQuaid off our hands for something like a 4th & 6th, move him out as he has no future with this team. I will drive McQuaid to the airport. I’ll pay gas and tolls — no need for parking though, just kick him out the door. Please don’t take Zaitsev back. Even if we get a 4th and a seventh from Toronto that would push us back about 17 spaces from our 4th and 7th we gave Boston. Considering Toronto is 17 spots ahead of us in the standings and not factoring in the lottery. Pray we can get a 3rd and a 5th. He may be better off packed in a bigger deal to enhance a return. If there is smoke, let’s just hope they have a stash of the good stuff. Approaching the end of rebuild season UNO, with a small chance at playoffs, are you kidding me! I expected to be feeding along the bottom this year! getting anything back for McQuaid is worth it. McQuaid, the picks sent to acquire him, the picks acquired in his trading. nothing. none. nada. will be an NHL player or have an impact on an NHL team. Sure McQuaid and Fast for 2 10th round pick. Ranger fans clearly were not enamored with Gorton on this pick-up and now Gorton looking to dump him…. Critical time for Gorton and the leadership as the AAA team is worse than Trump’s diet and prospects in Hartford are slow to learn…. If they go McQuaid for Zaitsev, a pair of short & long dated 1st & 2nd rd picks, I’d perversely be in favor of it.